What are you guys towing with your sequoias to go camping ⛺️? No brainer on the wheel choice. 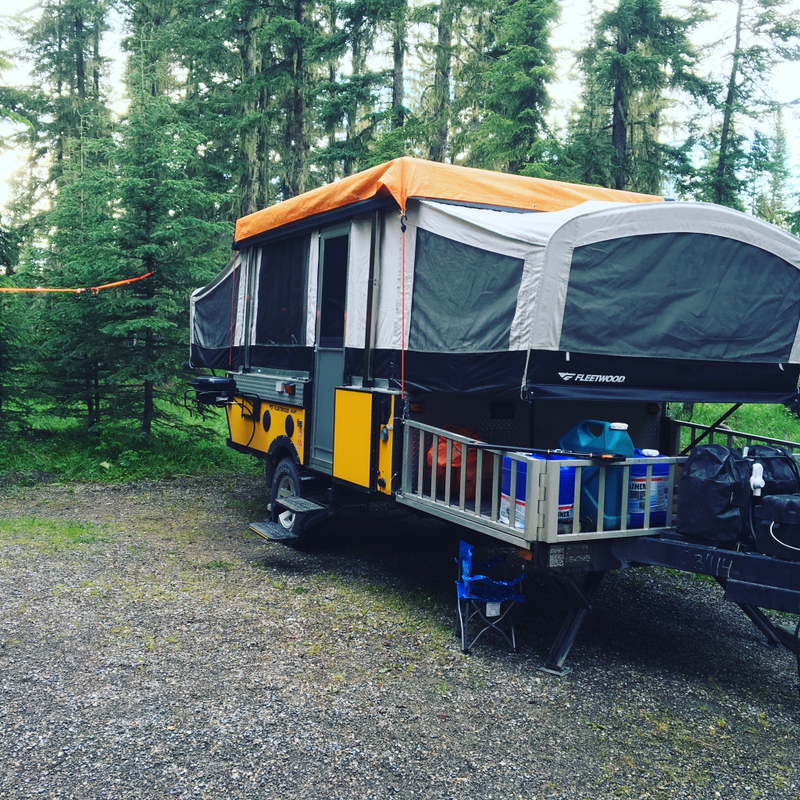 I'm thinking of getting a little pop-up camping trailer like yours to ease the family into camping... any suggestions seeing as you have one? We have TWO girls so I had to get one with a toilet and a shower inside. In my model they are separated so I like that. It has two king size beds with the couch and dinette that can be beds too. You can find ones that have a slide out or two, some even have a flat hauling section to put a four wheeler and a dirt bike. I would always recommend staying at or under 5500lbs total weight for whatever you're thinking about. I've always been a proponent of the old 80% of your rated towing capacity. My rig sits about 4000lbs fully loaded the way we load it and it pulls like a dream. I like pop ups mostly for the weight and having a level bed at night, otherwise I would be sleeping in a tent still. Yeah my wife and daughter want a toilet. Lol... so trailer it is... they're not so fond of the camping toilet idea. Here's what we have. It's a 2007 Fleetwood Evolution E2. 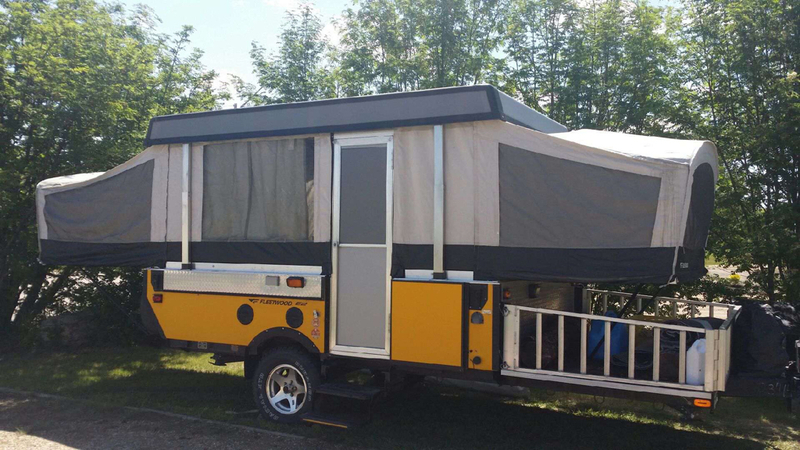 Has a toilet, indoor shower, outdoor shower, dinette, a queen size bed and a twin bed, furnace, fridge, stove and an outdoor BBQ. 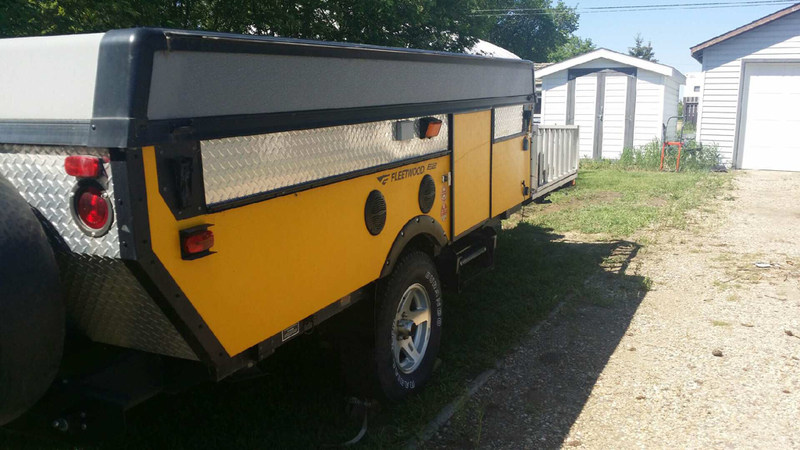 Has a deck in the front for a quad (up to 800 lbs) or whatever you want. And the best part - it has 22 inches of clearance! That fleetwood is awesome! A little long for an Overland Expedition, but awesome none-the-less. Yes. It's 21 feet from tongue to the spare tire. Here is my camping setup. It isn't anything fancy, but it has two double size beds and is bullet proof. It is based off a trailer that Costco used to sell that was made by Lifetime trailers. It has a custom width axle with Toyota lug pattern and a locknroll hitch. The original frame was only rated for 2,500ish pounds, so it's not going to be very heavy duty. 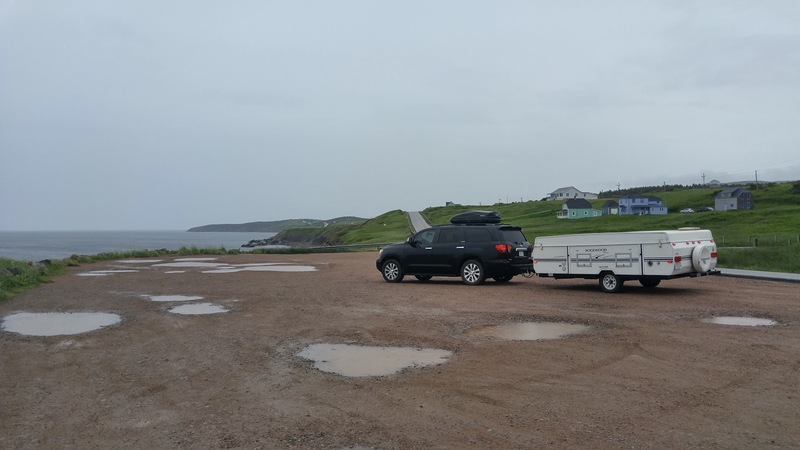 It's more of a starting point for having a dedicated adventure trailer. I"m ordering a 3,500 axle to fit some 6x5.5 hubs. It's going to start fairly minimalistic and will grow as we decide how we want it laid out. I'm hoping to have the bones built in the next month or so. Wow that's more drawing than I did. Good for you on making a plan and putting it to paper. Whe it was just my wife, one son and me, we used to go camping and wheeling with the truck and tent. More kids came and less wheeling but still camping. We haven't been either in a long time. Last summer I drove to Montana with my second son in my Tacoma and went camping/wheeling with my friend and what do you know, the bug bit again. So I got the Sequoia with the thought of getting us all out again. Looking at getting the same friends hard shell roof top tent and making a platform for the back of the sequoia. If all goes well, progressing to some sort of A frame pop up trailer. Here is my camper. It's a 2002 Rockwood 2317G. After beefing up the frame, running a 2x2x1/4" box steel front to back, building a plywood box, and making a cooler/stove slide out from MDF scrap, I have been very pleased with the results. Holy lack of mudflaps batman. All joking aside I love that little trailer. Nothing cause we air matress up the sequoia! too broke for a trailer honestly but she works perfect! We stay at state parks so bathrooms and stuff are covered but yea we sleep and chamge and travel in our beast!